When iPad 2 was demoed so the smart covers for the iPad 2 were also shown off the same time. The cover was made up of magnets to fit in the iPad 2 and the Smart cover was not that smart to coup up with iPad 2. Many people in huge lines wasted their time to only get a cover which was not Smart enough. The Smart Cover was modified with beautiful and classy cover by Miniot, a Netherlands-based third-party accessory maker. 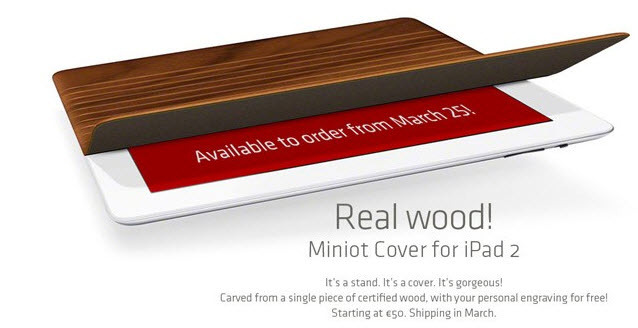 Dubbed the Miniot Cover, it’s basically a Smart Cover redone in wood. Yes, it’s got magnets that snap it into place, just like Apple’s cover. Unlike Apple’s version, the Miniot Cover boasts the level of detail plus fit and finish that oozes with class. The wood pattern is seamless across the bars and flush with the device. The effect is jaw-dropping and resulting in the executive feel that’s bound to make you the star of the boardroom. This lets you affix the device upright for handsfree use or leave it flat for easy typing. the Miniot Cover can be yours for 50 Euros, or $69, the same asking price as Apple’s Smart Cover in leather. It’s available to order now through Miniot’s online store.